The Victron Energy Autotransformer is the one item we sell that causes the most confusion. It can be used in a number of different applications but this article is about using it with a US 120/240 volt shore power system and with a 240 volt inverter charger or generator. In this case we are using the Autotransformer in its capacity to make two split phases of 120 volts from a 240 volt input, and to balance the loads between the two legs. The input to the Autotransformer can be shore power, a generator, or an inverter, all at 240 volts. The Autotransformer is used to split the 240 volts into two legs of 120 volt and to balance the load between the two legs. To understand how it works it helps to look at the schematic. What you can see in this diagram is the two shore power legs, Line 1 (red) and Line 2 (black) go straight through the transformer and out the other side. For these wires it isnt even a transformer, the only interruption is the circuit breaker you can see on the incoming side. Between the two legs you can see a coil of wire with a center tap. The incoming legs are always at 240 volts with respect to each other, when Line 1 is +120 volts Line 2 is - 120 volts and vice versa. The center tap is always exactly between the two at 0 volts. The Autotransformer has made us a new mid point and so allows us to have two legs of 120 volts. When the source of power is on board the boat the autotransformer gets to work like shown above. 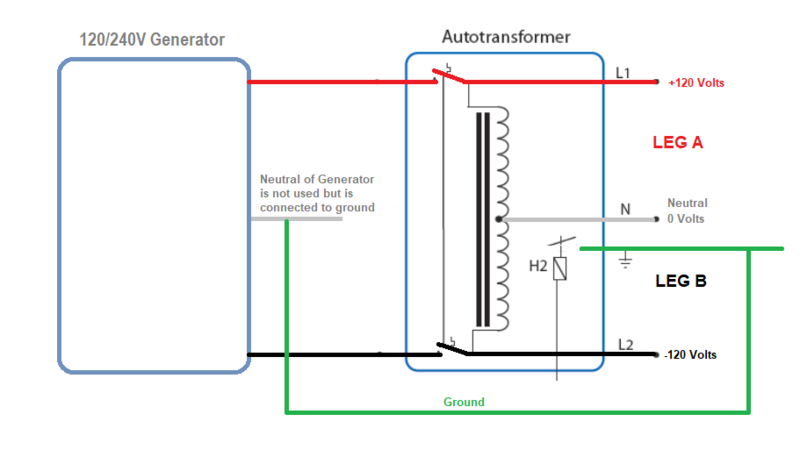 The generator or inverter produce two hot legs, neither of which is grounded, then the Autotransformer defines the neutral as being the mid point between the two legs. If we draw the diagram with a MultiPlus or Quattro Inverter/Charger it looks like the drawing below. Note that you have to program the MultiPlus or Quattro to use the ground relay output. For more about programming see my blog post on the subject. The above drawing shows the connection area of the Autotransformer. The output is to the left, there are two hot legs represented by the black and red wires, and one common neutral. On the right is the input connection with two hot legs. There is a single ground connection and there is also the ground relay connection which connects to the ground relay terminal of the MultiPlus. Below is the corresponding terminal area on the Multiplus where the ground relay connection is in the middle of the block. Un-checking the ground relay box disables the internal ground relay in the MultiPlus and enables the external ground relay. The external ground relay on the MultiPlus is connected to the Autotransformer and actuates its ground relay. When the boat is connected to shore power the neutral is not defined on board, this is to avoid having the water become a parallel path for current. The boats ground is connected to the water and the dock ground is connected to the water and if neutral were connected to ground in both places the water would be part of the current path. Current through the water is never good whether you are a fish or a swimmer. When shore power is active the inverter charger disengages the ground relay control. The drawing then looks like this. 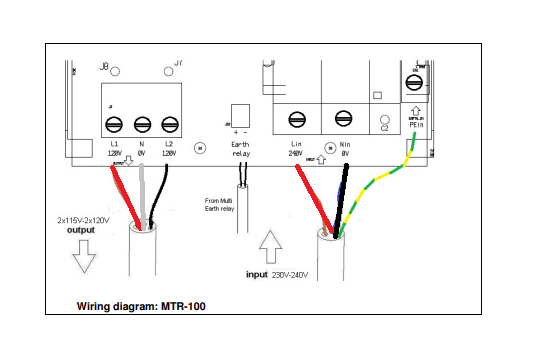 In the drawing above ground and neutral are connected at the dock but not on board. The ground relay is not activated. Even though the shore neutral is not taken on board the boat it is recreated after the Autotransformer. 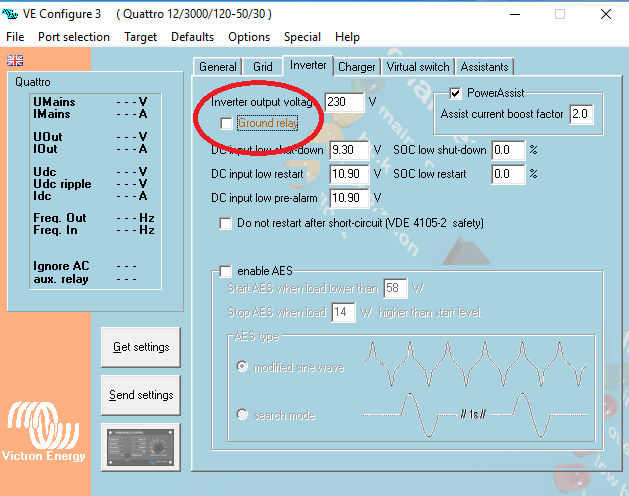 There is always some confusion when connecting the MultiPlus or Quattro in these situations. The 230 volt models are designed for European 230 Volt where one leg is neutral and one leg is hot. People are understandably hesitant to connect two hots, one to the terminal labelled line and one to the terminal labelled neutral. That is how it gets connected, Line 1 goes to the terminal labelled LINE and Line 2 goes to the terminal labelled NEUTRAL. The shore neutral is not connected, the incoming shore ground is connected. All the technical details complicate the issue. 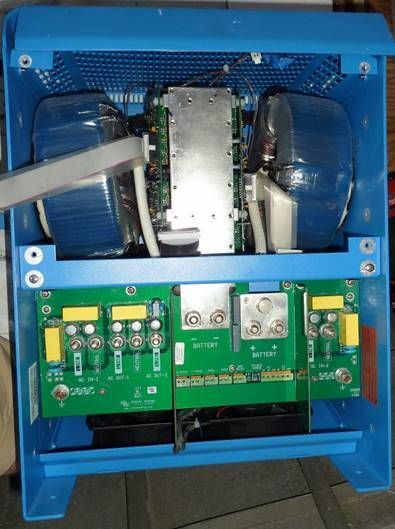 Using an Autotransformer in the way described above has all kinds of advantages. Its a huge advantage not to take on board the neutral of a 120/240 volt system. Anyone who ever had a loose neutral connection will tell you what happens. The voltage of the two legs is only equal because the neutral connection is grounded on the dock. Once you lose the neutral connection the two legs are floating and the voltage on leg A or leg B will depend on the loads on those legs. It would be easy to find one leg with 180 volts and the other leg with 60 volts causing damage to all kinds of equipment on board. Consider for example a 30A 120/240V split phase supply. The supply could be the grid, a generator or two stacked inverters. Some of the loads connected are 240V, others are 120V. On each 120V leg the load should not exceed 30A. 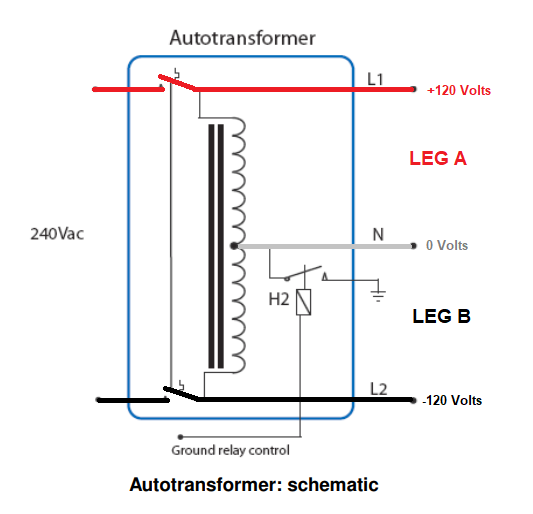 The problem is that as soon as 120V loads are connected, the two legs will show a different current. This is because the 120V loads on the two legs will never be balanced. A 120V 1200W hairdryer, for example, will draw 10A from one leg. A 120V clothes washer could even draw in excess of 20A from one leg. Between the two legs the difference in current, or current unbalance, will therefore often be 20A or more. This means that the 30A supply will not be used up to its full potential. By the time one leg draws 30A, the other leg may be drawing no more than 10A, and increasing the 240V load, for example, will result in an overload of one leg while the other leg still has spare capacity. Theoretically, the total power that can be drawn from a 30A 120/240V supply is 30 x 240 = 7,2kVA. In case of 20A unbalance, the practical maximum will be 30 x 120 + 10 x120 = 4,8kVA, or 67% of the theoretical maximum. to create a new neutral, any load unbalance is “absorbed” by the autotransformer.